The dust hasn’t even settled on the 2019 Superstar Shake-up, but WWE is already heralding the start of a new era tonight in Des Moines, Iowa! One of the last piece left from this year’s roster reshuffling is the United States championship. Samoa Joe was reportedly in a sick bed last week, so he and his red, white and blue belt didn’t show up on either brand. But with Finn Bálor and the secondary men’s singles belt officially moving to SmackDown, the rumors Joe would be coming back to Monday nights weren’t exactly surprising. With those rumors came word the interaction Joe had with Braun Strowman on the blue brand before the Shake-up would lead to his first program on Raw. Which got me thinking about the Monster Among Men. A feud with the U.S. champ should lead to Braun’s first singles title reign, right? Joe will probably use villainous means to win a match or two, but you have to figure the good guy who’s also a monster will go over in the end. We’ve thought that at various points when he was chasing the red brand’s top prize in the past, though - and Vince McMahon never pulled the trigger on the former strongman. Instead, Strowman’s mostly been used as Roman Reigns’ foil, or as a comedy/kid’s act sideshow. Well, the Big Dog is off to Tuesdays. With Bálor also on SmackDown and Dean Ambrose riding off into the sunset, there’s an opening for Raw’s #2 babyface. A title run could be the perfect way for Braun to get in the main event mix as something more than what he’s been for the past year or so. There’s some new competition who moved over along with Joe in the Shake-up. AJ Styles teamed with 2⁄3 of The Shield last week, and The Miz could be poised to make a lot of noise as a fan favorite. But the Phenomenal One is getting older and may be in line for more of a Rey Mysterio role, and since 2011ish the A-Lister’s another guy Vince has kept in the upper-midcard. It seems to me like the door is open for Strowman to finally make a run to the top as a face. Do the powers-that-be see things the same way? Will fans still buy him as something other than Nicholas’ partner and Colin Jost’s worst nightmare? As soon a Joe shows up on Raw, we may find out. We’re finally past WrestleMania and the Shake-up, so hopefully we’ll start getting official previews for these shows which give us more than lines like this: “it’s anyone’s guess who will be next to challenge Seth Rollins for his Universal Championship.” Our guess is it’ll be Drew McIntyre, by the way. She’s technically on team blue, but as long as Becky Lynch has both the Raw & SmackDown Women’s belts, she’ll be on both shows. And she actually has an official challenger on this one! Lacey Evans and her weak kip-up beat Natalya to become #1 contender. We may even find out when the Lady will get her shot at the Man tonight. 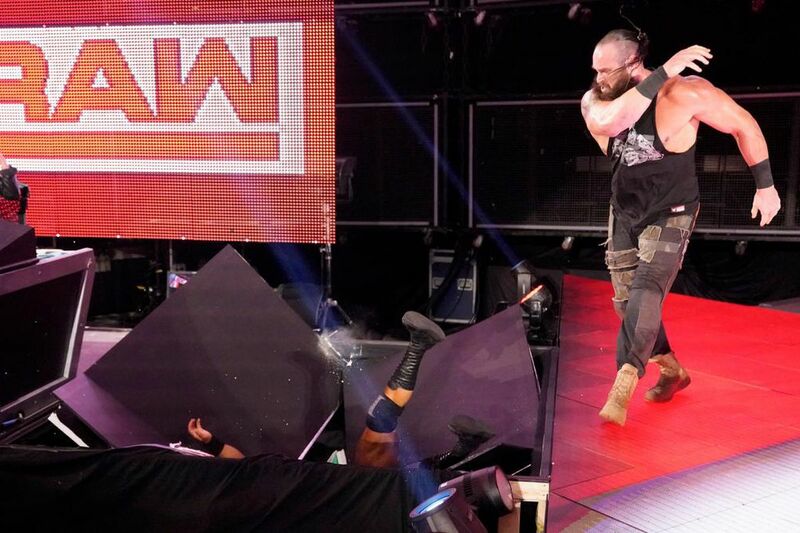 Raw’s men’s pairs division looks almost as strong as SmackDown’s women’s ranks do. With The Usos and The Viking Experience arriving, plus Aleister Black & Ricochet and The Revival staying, how long will Curt Hawkins & Zack Ryder be able to remain the Raw Men’s Tag Team champions? Given how many ladies were either shaken over to Team Blue or who are out of action for injury, unhappiness, pregnancy plans or all three, we’re guessing the next challengers for The IIconics Women’s Tag Team championship will come from SmackDown. But maybe we’ll find out we’re wrong tonight. - Miz’s debut involved getting color while trying to kick his old rival Shane McMahon’s ***. The McMahons are technically on both brands, so it looks like Shane didn’t get the final word with his win at ‘Mania. - He’s technically a Raw Superstar, and the buzzard and rocking chair toy teasers we’ve seen the last few weeks are almost certainly for him. Is this the night Bray Wyatt finally returns? - What will Baron Corbin and Bobby Lashley do now that there’s no more Shield to job to? Will Andrade and Rey finally get a marquee spot for their rivalry now that they’re both on team red? Has anyone checked on Mojo Rawley since he got that weird rash on his eye? Four weeks until Money in the Bank! What will you be looking for on Raw tonight? bigego24, ITO, B Sox and 1 other person like this. So who catches the bans this year? ITO, fx2 and JBII like this. Bend_The_Knee and JBII like this. 6 Rings G.O.A.T. and D Fly like this. fx2 and D Fly like this. On the latest edition of Wrestling Observer Radio, Dave Meltzer announced that on Raw The Revival vs. Ricochet and Aleister Black for the Raw Tag Team Championship will be added to the WrestleMania card. He then said on Tuesday, it's expected to be announced that the Uso's will defend their titles in a multi-man match, with The Bar appearing to be a definite. He mentioned that the Hardy's were in the original plans for the match but he can see Rusev and Nakamura put in the title match. Meltzer also noted that John Cena will have a match at WrestleMania but it is unclear who he will be working with. DoubleH, JBII and Meangene45 like this. fx2, 22stylez and Sharpshoeter13 like this. fx2, D Fly and JBII like this. Case, dcallamerican, nomnom and 3 others like this. New Day not gonna be involved in an SD tag title match? caleekicks, dcallamerican, Peep Game and 4 others like this. Need some LWO shorts for my honeymoon. Meangene45, Sharpshoeter13 and Bad Moon Rison like this. green rhino123, Sharpshoeter13 and Bad Moon Rison like this. fx2, JBII and Sharpshoeter13 like this. dangerousg, ITO, Meangene45 and 3 others like this.